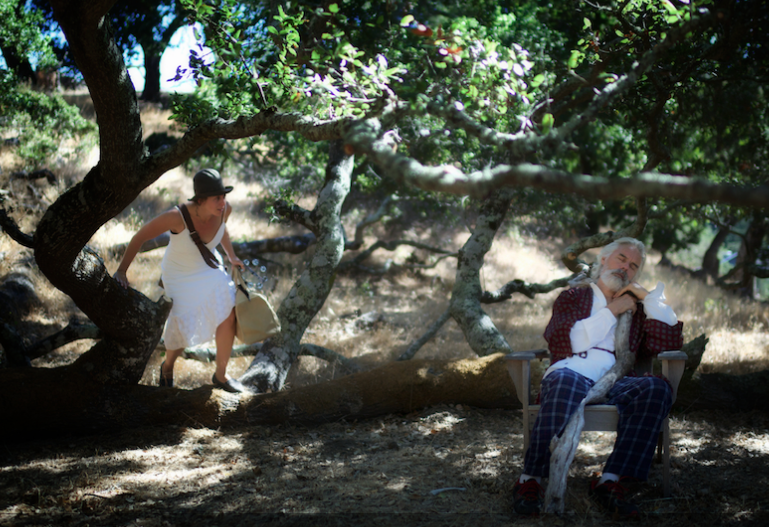 Ava Roy and John Hadden in “King Fool”, performing on a hillside in San Anselmo, one of several locations for this production. Photo Credit: We Players. We Players pursues a mission to present what they describe as “site-integrated performance events that transform public spaces into realms of participatory theatre.” Trust me, this is not as dull or pedantic as it might sound. In fact, this company presents some of the most exciting theatre you are likely to see. Ever. Anywhere. They have retold the story of Odysseus on Angel Island and presented Macbeth at Fort Point under the Golden Gate Bridge where the fog rolled over the fort walls to nearly consume audience and actors, making Castle Dunsinane as real as a roast beef sandwich with sound effects provided by the mighty Pacific colliding with the waters of the San Francisco Bay. 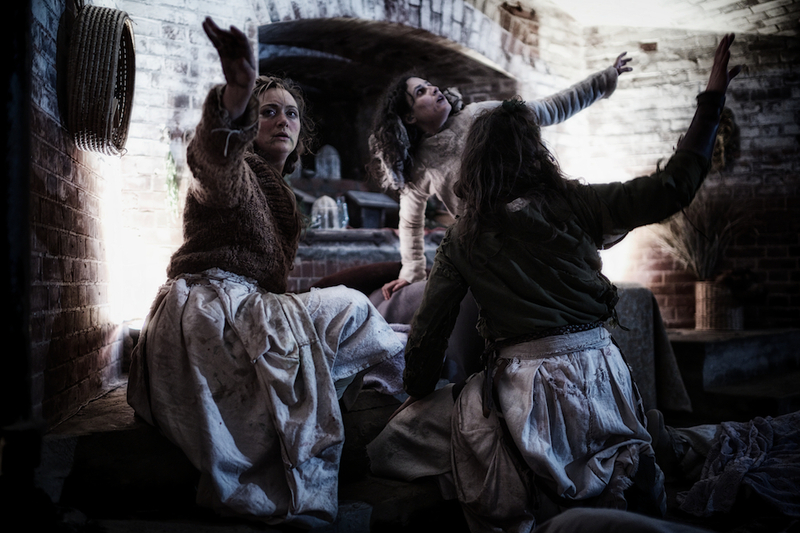 The Three Weird Sisters in the We Players production of Macbeth staged in Fort Point, under the Golden Gate Bridge. Photo Credit: We Players. Earlier this year they hosted a concert performance of original Canciones del Mar (Chants of the Sea) staged aboard the tall ship Balclutha, docked at Hyde Street Pier by Fisherman’s Wharf. Currently, they are presenting “King Fool”— an adaptation of Shakespeare’s “King Lear” for two actors. The two actors speak lines from various persons in the play, occasionally out of sequence, in the characters of the unhappy King and his daughter Cordelia. Although it is possible for informed audiences to discern the story of King Lear as written by Shakespeare, that is not the primary point of this adaptation. Removed from the context of the mythic story of the foolish king who divided up his kingdom, it becomes a perfectly modern story of a daughter trying to care for a dying father whom she is losing to old age and dementia. Ava Roy and John Hadden are both excellent as daughter and father. They deliver the Shakespearean text with grace, conviction and clarity. They do not shy away from harsh details, as when the old man soils himself or cannot recognize his own child. But gentle love and lyrical poetry are also in evidence, and the overall experience is a joyful celebration of a touching relationship. The performance I saw took place one late afternoon, high on a hill in a rural corner of San Anselmo in Marin County. The audience trekked to this high point as the sun began to lower in the sky. We were seated on low stools or knelt on the ground. The actors were accompanied by bird song and quiet. In a moment of awesome serendipity, a strong breeze rose unexpectedly just as King Lear began to intone the famous speech that begins “blow winds blow/and crack your cheeks with rage”. It was thrilling. Such happy accidents are courted successfully by We Players in their various interesting locales. Their details cannot be predicted, but their occurrence is to be expected. “King Fool” does not end with the hour long performance. Following each show, the audience is invited to remain and participate in an intimate and gently led discussion about the issues the play raises on the experience of children and their aging parents, death and dying, love and loss. “King Fool” will be given nine more performances between September 11th and September 28th, in a variety of locations ranging from San Francisco’s Mission District to the Marin Headlands to a private home in Marin County to Mission Bay. “King Fool”, adapted by John Hadden from King Lear by William Shakespeare, performed by Ava Roy and John Hadden, with the creative participation of Jamie Lyons and Lauren D. Chavez.